1. Mix the chilli oil, baharat and lemon zest in a bowl. 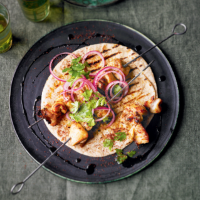 Cut each chicken thigh fillet into 4 pieces and add to the baharat marinade. Cover and place in the fridge to marinate for at least 1 hour, or preferably overnight. 2. Preheat the griddle or grill to medium-hot. Remove the chicken from the fridge and thread onto 12 metal skewers. Cook for 10-15 minutes, turning frequently, or until the chicken is thoroughly cooked through with no pink meat and the juices run clear. 3. Toss the onions with the lemon juice and leave to steep for 10 minutes. Add the olive oil, sumac and parsley and toss to combine. 4. Serve the chicken skewers with the onion salad and toasted flat bread, drizzled with extra olive oil.